Since its release last March, Analyze in Excel has been warmly welcomed by the Power BI community. It brought new meaning to the term better together that Power BI and Excel are working hard to achieve. With this month’s release of Power BI publisher for Excel, we’re pleased to announce that Analyze in Excel is now easier than ever, and can be initiated directly from Excel using Power BI publisher. With this release, there’s no need to download .odc files, and no need to manually install OLE DB driver. Just install the latest version of Power BI publisher for Excel, and use Connect to Data from the Power BI ribbon tab in Excel. Why should I use Power BI publisher to do Analyze in Excel? That's cool! So how do I use it? After you select the workspace, and the report or dataset, just press the Connect button and that’s it! You’re ready to analyze with a pivot table connected to your data in Power BI. 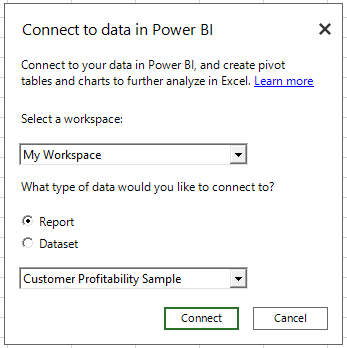 The connection is live, meaning that each interaction on the Pivot table will initiate a query to Power BI to get fresh data. Note: Currently, data that was shared with you, but not directly visible to you in Power BI, is not available in the Connect to Data dialog. SQL Server Analysis Services On-premises source: Datasets in Power BI that originate from SQL Server Analysis Services that reside inside the organization network (‘On-premises”), will be connected to the on-premises source and not through Power BI. This means that the user trying to connect must be on the on-premises network, and also authenticated on the Analysis Services in use. What if I don’t have any data in Power BI yet? If you’re new to Power BI and don’t have any data yet, don’t worry! We have a special treat just for you: Power BI publisher for Excel will recognize that you don’t have data, and will suggest that you import available sample data into your Power BI workspace. Once you approve, the sample data will be deployed on your Power BI workspace and a pivot table that is connected to it will be created. This update also includes bug fixes and stability improvements. For addiitonal education on Analyze in Excel, see here.